Punjab University has announced the Pre-Admission Entry Test Schedule 2018 for its various Institutes / Departments / Colleges / Centre. The schedule has been announced for both Undergraduate and Graduate Programs. The Pre-Admission Entry Test Forms for the admissions of the academic year 2018-19 will be available at the respective Institutes / Departments / Colleges / Centre and Gujranwala / Jhelum Campus from Monday, 9th July 2018. The last date for submission of the Entry Test Forms to the respective Institutes / Departments / Colleges / Centre and Gujranwala / Jhelum Campus are Monday, 23rd July 2018. 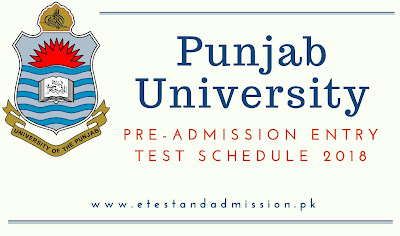 Punjab University and its Campuses will remain open on Saturday and Sunday for the availability / submission of the Entry Test Forms. The result of Entry Test will be published on the website and also on the notice board of the concerned Departments and Campuses on Monday, 20th August 2018.